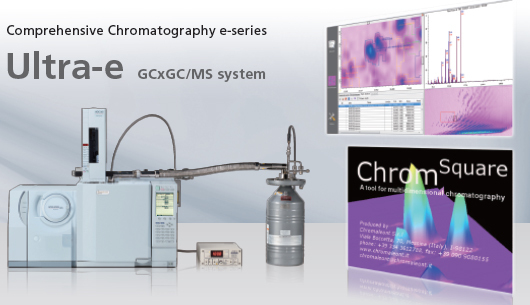 ChromSquare GC/GC is data analysis software for comprehensive gas chromatography (GC/GC). ChromSquare provides easier, more reliable analysis of information obtained from GCxGC analysis, enabling everything from qualitative to quantitative analysis. This software is a product of cooperative research with a group headed by Professor Mondello at the University of Messina (Italy). This group implements cutting-edge research in the field of comprehensive 2D chromatography. Modulation time and spectra are used to decide whether a peak belongs to a certain spot. 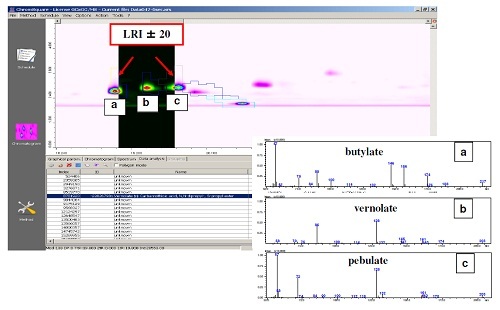 Displays peaks in the corresponding one-dimensional chromatogram using the same color as the spot boundary in the 2D map. 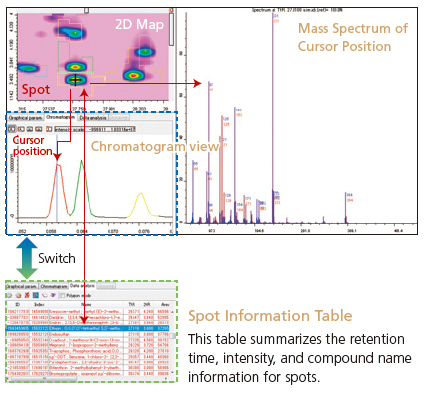 Moving the cursor across the 2D map displays the corresponding location on the one-dimensional chromatogram and displays the mass spectrum corresponding to that position. Shows the relationship between the 2D map and spot table highlighted. 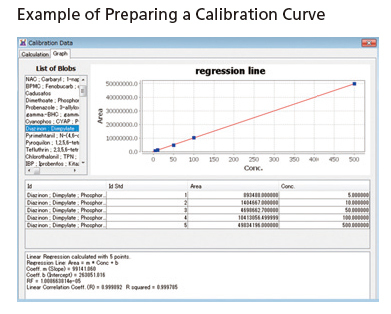 Perform quantitative analysis tasks by simply switching between three panels. 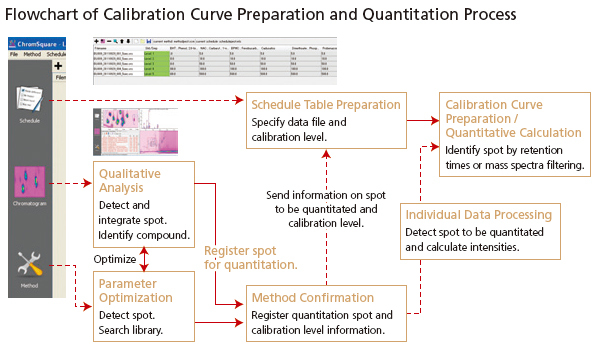 Simply switch between the three panels displayed in the same window (Schedule, Chromatogram, and Method) to perform qualitative analysis, prepare calibration curves, or even perform quantitative analysis. Identify spots from multiple sets of data for quantitative analysis using retention times or mass spectra similarity filtering. In addition to being able to directly import data from GCMSsolution, ChromSquare can also use GCMSsolution mass spectra search technology. Directly import data from GCMSsolution. Search spectra using the GCMSsolution library search engine. In upto 5 libraries can be searched simultaneously including linear retention indices. In addition to the general-purpose NIST libraries available for GCMSsolution, an extensive selection of mass spectral libraries from Shimadzu can be used, such as the FFNSC Library for flavor and fragrance and a Pesticide Library. 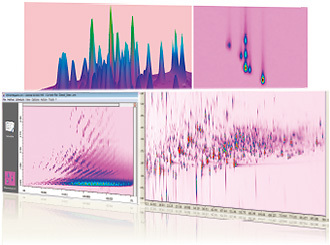 Mass spectral similarity search function with linear retention index filter (LRI filter) enables you to identify unknown compounds in two-dimensional chromatogram more accurately. The LRI filter narrows down a similarity search result by filtering a range of retention indices, which greatly simplifies the search procedure of unknown compounds. GCsolution data files (.GCD), GCMSsolution MS data files(.QGD), AIA/ANDI data files (.CDF), etc. Uses Shimadzu GCMSsolution search engine. Registers results in detected spot table. All libraries supported by GCMSsolution, such as NIST libraries and the FFNSC Library for flavor and fragrance, can be used. Similarity search function using retention indices. Must have GCMSsolution Ver 4.10 or later installed.